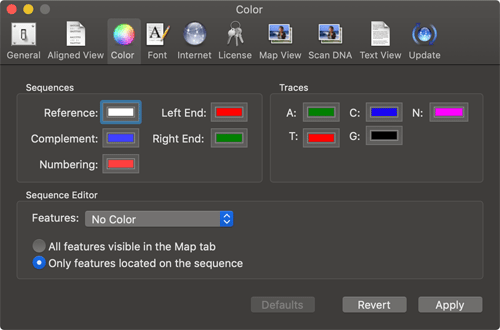 macOS Mojave (macOS 10.14) has a new "Dark Mode" appearance option, where the interface changes to have dark window backgrounds with light colored text. The advantages of dark mode include improved readability of text, better contrast and reduced eye strain. Users who like to work at night or in darker environments may also benefit from Dark Mode. Applications built for macOS do not automatically support Dark Mode, but have to be specifically coded to take advantage of the feature. 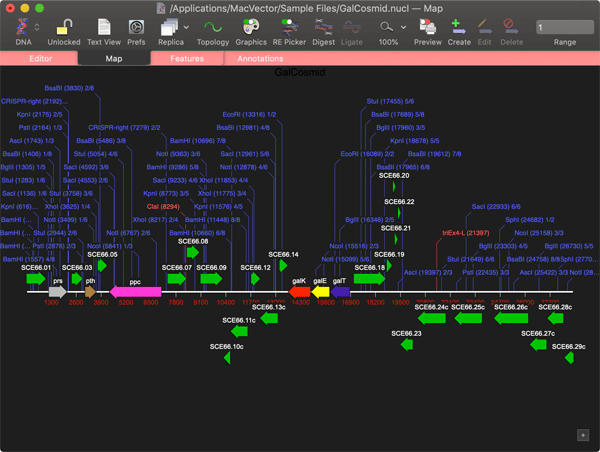 MacVector 17 was the first release of MacVector to specifically support Dark Mode. 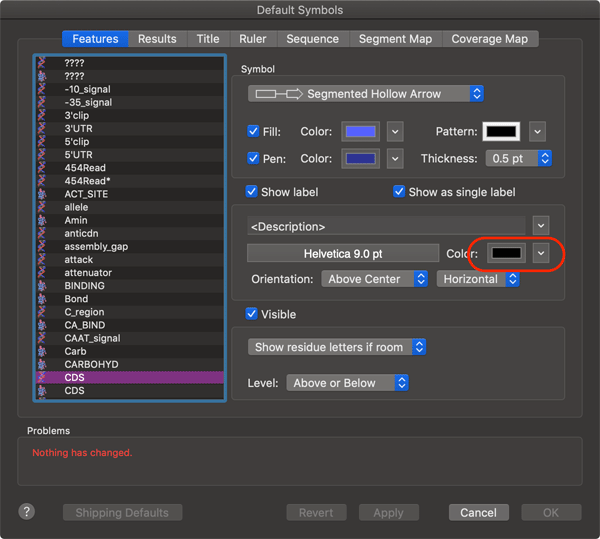 MacVector's default colors have been designed with the Aqua ("Light") mode in mind. So the colors may not always be ideal for your needs, especially in Dark Mode. 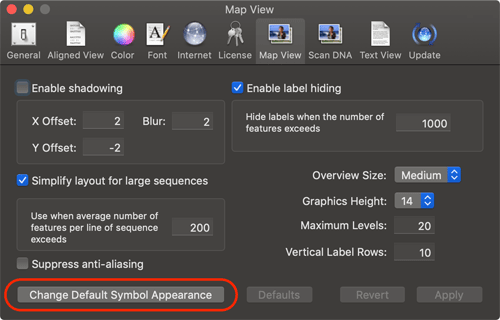 But, MacVector gives you a lot of control over the default appearance of the display. 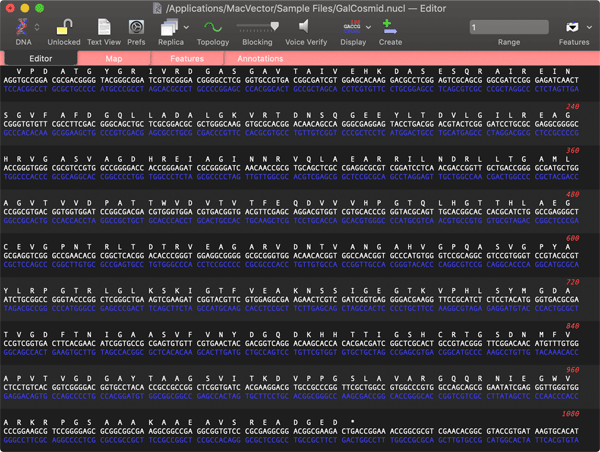 This opens the Default Symbol Editor where you can modify many aspects of the appearance of every GenBank feature type. From a Dark Mode perspective, the label color might be one of the more important settings. Note that you can actually select multiple (or all) feature types in the left hand pane and change specific settings for all of the feature types with a single click. If you would rather have MacVector run with white window backgrounds, even when you are running macOS in Dark Mode, this can be accomplished with some simple commands. To do this, you should open the macOS application Terminal.app. You will find this in the /Applications/Utilities/ folder. When you start MacVector again, it should be running in Light Mode.